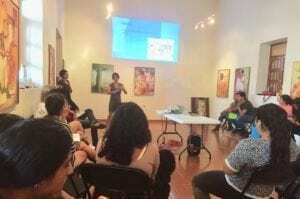 As an observer, I visited the session: Advocacy and media for social and political change as part of the Training Process for Youth in Quintana Roo, which took place in the municipality of Felipe Carrillo Puerto, the halfway point between Cancun and Chetumal, on March 10 and 11. “Success should not be measured by whether you have a profession or not, or if you are a waiter or a domestic worker. 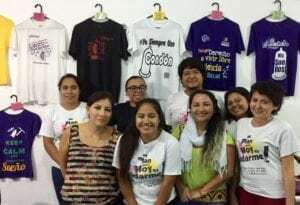 Every job is important, the focus should be on ending situations of oppression and low wages.” – Nayeli Yoval Segura, facilitator in the Political Training Process for Youth in Quintana Roo. The Training Process is the product of an interdisciplinary, cross-cultural and interinstitutional alliance between leaders of CAMY Fund grantees: Mayra of Elige Red de Jóvenes por los Derechos Sexuales y Reproductivos, Ricardo of México y Caribe Jóvenes (GOJoven México) and Marco Antonio of Servicio, Educación, Sexualidad y Salud (SEEDSSA). In spite of the challenges, especially of being geographically far away, these three leaders managed to launch this process that makes it clear that sexual and reproductive rights are human rights and that young people are looking to build social wellbeing for their communities through making decision about their own bodies and life plans. Live free of violence, by seeking peacebuilding spaces and eliminating the normalization of violence in public and private spaces. They discussed sexual violence, gender-based violence, violence in the language, for being indigenous, for having an active sexual life, for being gay, lesbian, bisexual, trans or intersex, for being a migrant or for having tattoos; especially at school and at work. Within the different types of violence, they discussed preventing and eliminating organized crime that increasingly has a daily presence in Quintana Roo, though it is not reflected in the media because of the risk of jeopardizing tourism in the region. Quality education, free, culturally comprehensive and geographically accessible to all. Protection of temporary, seasonal or permanent migrants, who come to work during the tourist season, or because they are studying or are passing through from Central America to other states in Mexico or to the United States. Decent employment with flexible hours that are compatible with continuing education or other goals, as desired, with a salary that covers basic needs (now it is $136 USD a month, but it should be of $882 USD according to the Salary Observatory), that is stable – with a contract, and that does not imply a rigid dress code(being inclusive with men who wear long hair and women who wear pants; being flexible with the use of uniforms or a specific image in the hotel industry for example). Social security, regardless of whether you have a job or not. They mentioned a universal pension, health services and other social benefits for those who need to be cared for (children, seniors, ill people, and people with temporary or permanent disability). Of the 25 young people, five had a job and none had social security. Long live the youth that build peace, equality and inclusion! The main objective of this visit was to meet with Marco Antonio and the Servicio, Educación, Sexualidad y Salud (SEEDSSA) in his office in Cancun and a few days later with Ricardo and the team from México y Caribe Jóvenes (GOJoven México) in Chetumal to provide training on procurement and diversification of funds as part of the technical assistance strategy offered to our grantees. It is deeply admirable to see the uninterrupted commitment, experience and enthusiasm of the SEEDSSA and GOJoven México teams to expand the exercise of sexual and reproductive rights to more people, regardless of their ethnic origin, educational level, sexual orientation, age and, in this complex context, beyond their political affiliation. Rights for all, all the time. Government agencies in Quintana Roo have managed to strengthen the State Group for the Prevention of Teenage Pregnancy (GEPEA for its acronym in Spanish)* with the essential participation of three civil society organizations: Elige, Red Posithiva Cancún and Redefine Quintana Roo. The objective of the group is to put into practice a strategic cooperation to implement public policy for the prevention of adolescent pregnancies, with full respect for the human rights of adolescents and young people, particularly their sexual rights. Claudette Gonzalez of the Secretariat of Government of Quintana Roo, who coordinates the GEPEA in this state. Rose Mary Perez y Perez, Irma Irene Mora Osorio and the whole team of the Quintana Roo Institute for Women. Irving Delgado Pérez of the Ministry of Education of Quintana Roo organized a meeting with key people within the education system at all levels. The CAMY Fund is in the process of selecting grantees for our Round 1 (2018) funding cycle, so I took the opportunity to meet with some organizations with the aim of getting to know them, their plans for the future and the contexts in which they work. It was a pleasure to listen to them and to know the diversity of strategies that exist in Quintana Roo, a state rich in knowledge and experiences that has no comparison with any other place in Mexico, or Mesoamerica. I faced many pleasant and intense surprises. *The GEPEA is the governmental mechanism that responds to the National Strategy for the Prevention of Adolescent Pregnancy (ENAPEA for its acronym in Spanish).